Energy consumption in small and medium sized re-rolling mills takes place in two forms namely (i) electrical energy, and (ii) fuel or heat energy. Electrical energy is used directly in main rolling process for shaping of hot billets into rolled product (rolling mill, and shears etc. ), in reheating furnace (coal pulverizer, blower, and pusher etc.) and also in auxiliary (roll turning machines, pumps, man coolers, overhead crane etc. ), and shop lighting. Fuel energy is used in the reheating furnace for raising the temperature of the feed material to desired temperatures (generally 1150 deg C–1250 deg C). The division of the energy in these two forms normally varies from mill to mill based on the practices employed as well facilities installed in the re-rolling mills in SME (small and medium enterprise) sector. However, the share of electrical energy in small and medium sized mill generally varies in the range 20 % to 30 %. Consumption of fuel energy takes the major share of the energy consumption and usually constitutes 70 % to 80 %. From a theoretical perspective, the energy in hot rolling is primarily determined by the requirements of reheating of feed material. The theoretical energy for deformation is only 0.02 GJ/ton (around 5000 kcal/ton), compared to 0.83 GJ/ton (around 200,000 kcal /ton) for heating billets when charged cold in the reheating furnace. Though it is not technically feasible to achieve theoretical energy consumption figures, but the energy efficiency of the rolling mill is depends upon how close it is to the theoretical consumption. Out of the total electrical energy consumed by a re-rolling mill, the share of the process of rolling is in the range of around 60 % to 70 %. The balance electrical energy is consumed in meeting the other electrical load of the unit. Efficiency of the electrical motor driven processes such as rolling, shearing, pulverizing of coal, and blowing of combustion etc. is dependent upon the efficiency of the system. The system consists of electrical motors and the drive units. Electrical load application in the rolling mill demands high precision and high overload ability. It is characterized by quickly changing loads, rapid alternation between driving and braking actions, constant torque in a wide speed range, and large torque steps. High-efficiency drives are the most suitable solutions during rolling of steel. With the use of accurate controlling and energy efficient drives, the re-rolling mill can optimize production cost, minimize maintenance, enhance reliability, and ensure quality of end product. Energy-efficient motors reduce energy losses through improved design, better materials, tighter tolerances, and improved manufacturing techniques. With proper installation, energy-efficient motors can also stay cooler, may help reduce facility heating loads, and have higher service factors, longer bearing life, longer insulation life, and less vibration. A three- phase electric induction motor with a flexible drive and large rotary torque is used as a driving device in the re-rolling mill. The flywheel used in drive system serves as a reservoir which stores energy during the period when the supply of the energy is more than the requirement and releases it during the period when the requirement of energy is more than supply. Flywheel is a mechanical storage device for storing the energy. In re-rolling mills the load fluctuates over a wide range. It is desirable to smooth out the fluctuating load, otherwise during intervals of peak load it draws a heavy current from the supply either producing large voltage drop in the system or requiring cables and wires of higher cross-section. The process of smoothing out the fluctuating load is known as load equalization. In this process, energy is stored during the period of light load and given out during the period of peak load thus power from the electric motor remains almost constant. The most common method of load equalization generally used in the re-rolling mill is incorporation of a fly wheel in the drive system. During the light load period the fly wheel accelerates and stores the excess energy drawn from the electric motor and during peak load period the fly wheel decelerates and supplies some of its stored energy to the load in addition to the energy supplied from the electric motor. Thus the load demand on the electric motor gets reduced. In the re-rolling mills, normally the 3-phase electric induction motor of high horse power is used due to the fact that the flywheel requires high torque to be driven initially. Once the flywheel stores sufficient torque which is required at the start up, the flywheel then requires less torque than what is required initially. If there a possibility exists to increase the starting torque supplied to the flywheel by using a flexible electrical, mechanical, hydraulic, flexible drives or with different combinations then the electric motor of lesser horse power can be installed to run the flywheel and the whole rolling mill. This can have a positive effect on economy, reduce the production cost, increase the production and reduce the power consumption. The time needed for the fly wheel to accelerate and achieve stable rpm is dependent on the horse power of the electric motor. Hence, there is a tendency to utilize motor with more horse power motor than required. In such scenario, there is necessity to introduce some sort of soft starting system so that motor of lower horse power can be used. Use of lower capacity motor reduces the consumption of electrical energy of the mill. The time-speed relationship of electrical motor and the flywheel at the time of start is shown in Fig 1. During the start of the motor if a graph is made between motor rpm (revolutions per minute) with time and flywheel rpm with time then the following is observed. In the initial situation the motor rotates at its full speed and the flywheel is at the stationary condition immediately at the start. 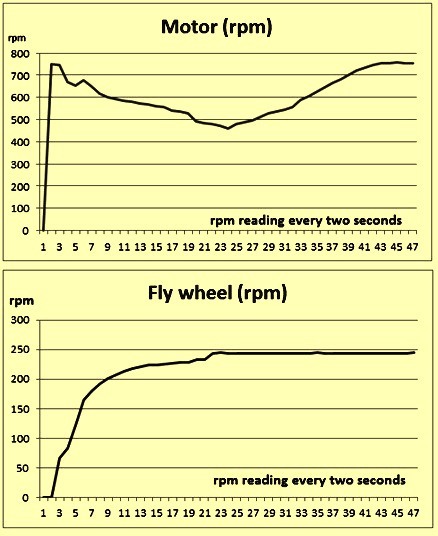 Then slowly the motor rpm decreases and there is an increase in flywheel rpm. After this, there is a continuous decrease in motor rpm and there is an increase in flywheel rpm since the motor is supplying the energy to the flywheel and after some seconds the flywheel rpm becomes more or less constant and attains its maximum speed. At this time the motor rpm start increasing and now the motor tends to attain the maximum speed. After an interval of a few seconds both motor and fly wheel run at constant maximum speed. During this period there is no change of voltage at any stage either in no load or load conditions. The voltage is constant (around 420 V). But there is sudden fluctuation in current of the motor which shows an increase. This shows that when motor runs at no load condition then the current drawn by the motor is lower and whenever the load comes to the mill the motor draws the higher current depending upon the temperature of the material being rolled. When the temperature of the rolling stock is low, the motor draws the higher current. This is due to the reason that the motor tends to regain the rpm and torque very fast and it draws the higher current. The consumption of the fuel energy takes place in the reheating furnace for raising the temperature of the feed material to the temperature in the range of 1150 deg C–1250 deg C. There are three types of fuels which can be used for providing heat energy in a reheating furnace. These are (i) solid fuel, (ii) liquid fuel, and (iii) gaseous fuel. The liquid and the gaseous fuels are usually high CV (calorific value) fuels and hence are more energy efficient than the solid fuels. The most popular fuel used by re-rolling mills in SME sector is the solid fuel. Non coking coal with a CV in the range of 6500 kcal/kg to 7000 kcal/kg is a preferred coal in these re-rolling mills for the combustion in the reheating furnace. In coal fired reheating furnace, besides CV of the coal, other factors which are important include (i) ash, moisture, and the volatile matter contents of the coal, (ii) consistency of size fraction during pulverizing, (iii) uniform mixing of pulverized coal with the conveying media (combustion air), and (iv) steady feed rate of the pulverized coal to the burner. Pulverized coal is normally conveyed suspended in air. Lean phase conveying method is used. This method normally uses the conveying air as primary air in the burner. In this case, the conveying requirements usually determine the primary air flow. This implies that primary air discharge velocity at the burner nozzle is the only variable which can be used to optimize the momentum and hence the combustion. Air velocity is to be sufficient to maintain the coal in suspension, but not too high since that will cause rapid wear and excessive pressure loss. The minimum recommended conveying velocity is 22 m/s with an optimum of 25 m/s and an absolute minimum of 19–20 m/s. At lower velocity, coal may drop out and accumulate in dead spaces giving rise to a severe fire and explosion risk since the accumulated coal is subject to spontaneous ignition. Use of coal as a fuel in the reheating furnace has the following deficiencies. Coal to be used as fuel in the reheating furnace need pulverizing which can be done in different types of pulverizing mills. Pulverizing of coal needs energy (electrical energy). The amount of energy required is dependent upon (i) size of input coal, (ii) fineness od the pulverized coal, (iii) type of pulverizing mill, and (iv) Hardgrove grindability index (HGI) of coal. Pulverized coal is pneumatically conveyed to the reheating furnace. An air blower is normally used for the blowing of air which is used for the pneumatic transport of the coal. This blower also needs energy (electric energy). The amount of energy required is dependent upon the quantity and the pressure of air to be blown. Coal contains moisture. The percentage of moisture in coal can range from 5 % to 10 %. This moisture does not take part in the process of combustion but gets evaporated in the furnace atmosphere to become water vapour which becomes part of the combustion gases. Considering that the moisture content of the coal is 6 % then the heat lost in water vapour is around 68 kcal/kg of coal consumed. Water vapour if condensed from the exhaust gas is a source of corrosion. Coal contains non-combustible material which is known as ‘ash’. The ash content of the coal can range from 10 % to 20 %. This ash does not take part in the process of combustion, but gets heated up to the furnace temperatures utilizing the heat supplied by the coal. The fusion temperature of the ash is to be higher than the furnace temperature. Finer particles of the ash known as fly ash are carried away by the exhaust gases while the coarser particles fall down. These coarser particles can react with the scale if suitable conditions develop inside the reheating furnace to form compounds with low melting points. These compounds in liquid form, if formed, can damage the refractories of the hearth. Considering that ash content of coal is 15 % then the heat lost in ash is around 70 kcal/kg of coal consumed. Since solids are involved in the combustion of coal, particulates content of the exhaust gases is one of the important pollution issues. This necessitates investment in the air pollution control devices. Another important issue in the coal fired reheating furnace is that the pulverized coal is not normally evenly distributed in the conveying air within the pipe. Often severe improper distribution of the coal occurs which is known as ‘roping’. This is not predictable but tends to become more severe the more bends there are in the system and the longer the pipe run. Roping is difficult to detect and quantify but adversely affects the performance of the burner with respect to flame pattern and heat release profile. Two important issues in energy management of the coal fired furnace are the control of exhaust gases and the recovery of the waste heat. These issues are important since these factors impact the consumption of coal in the furnace. Exhaust gases from the reheating furnace leave the furnace at a temperature which is higher than the temperature of the steel material in the furnace. Sensible heat in the exhaust gases while leaving the furnace can carry around 35 % to 55 % of the heat input to the furnace. The higher the quantum of excess air and the temperature of the exhaust gas, the higher is the outgo of heat from the furnace. Hence the waste heat recovery plays a very important role determining the fuel efficiency of the reheating furnace. One of the important methods of recycling the sensible heat of the exhaust gases back to the furnace consists of preheating of the combustion air in a waste heat recuperator. Another factor which affects the consumption of fuel energy in the reheating furnace is the thermal efficiency of the furnace which is normally in the range of around 20 % to 30 % in the case of pusher furnaces. The low efficiency is since a lot of heat is lost. The loss of heat in the furnace is due to several reasons which include (i) heat stored in the furnace structures, (ii) loss of heat from the furnace outside wall and structures, (iii) heat carried out by implements, tools, and equipment, (iv) heat required for heating the cold air infiltration in the furnace, (v) heat carried by the excess air used for combustion in the furnace, (vi) heat loss in the exhaust gases, (vii) heat losses due to leakages, and (viii) heat loss to the cooling water used for the cooling of the skids. The largest source of heat loss is through the exhaust gases exiting the furnace. The higher the furnace temperature, the greater is the loss through the exhaust gases.